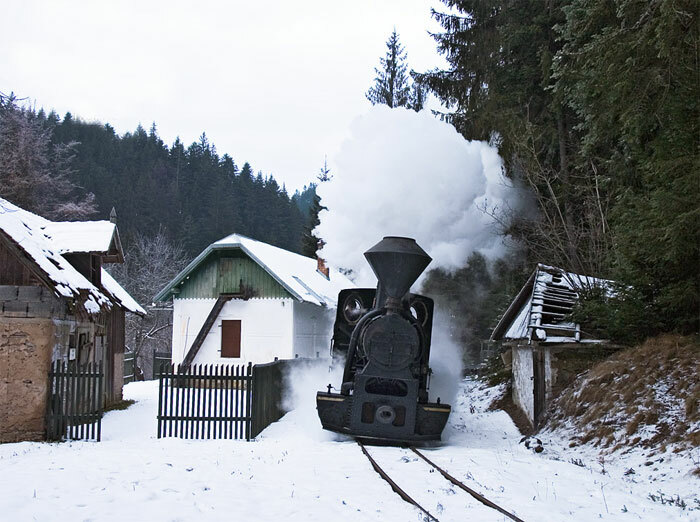 In central Slovakia there survives a solitary 760mm gauge forestry line, operating as a tourist railway. At its busiest over the summer period, it does not see much use in the winter months. 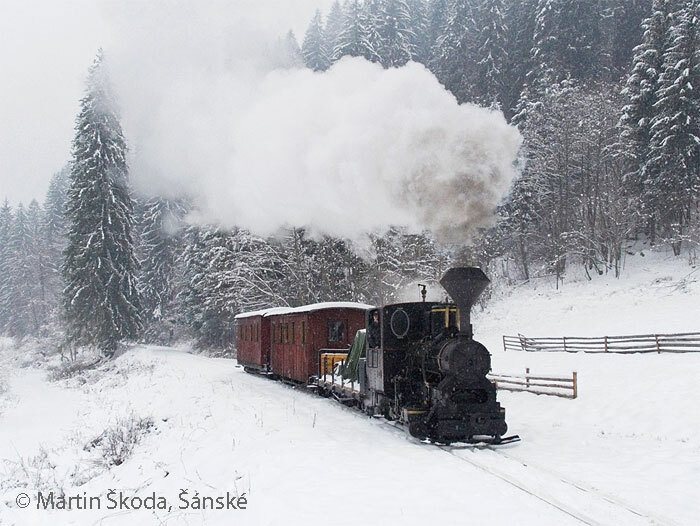 In this mountainous region of Slovakia the ground often has a good covering of snow  ideal for winter photography. We requested a winter special event and they agreed to our wishes, although if there is too much snow the ploughs will not be able to clear the line fully. That’s the risk of every winter tour, but can also be the charm of such an event. We can only accommodate a small group on this line as space on the line in deep snow may well be limited. We’ve decided to use rail to travel to the site as there is no airport nearby which is served from major European airports and a long bus ride over wintry roads is not appealing. 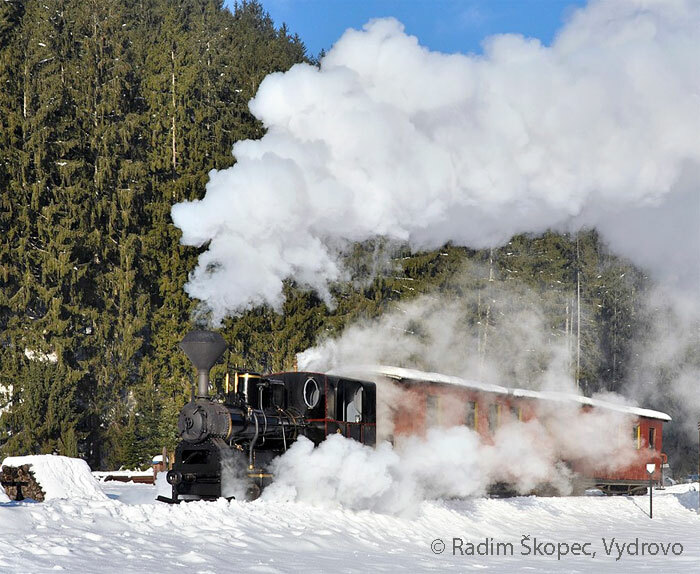 We’ve planned this tour as an extension to the winter steam tour in the Romanian Carpathians. From this region it would take you 16 hours by bus, and this only if the roads are okay. So the train connection seems to be much more convenient, although this will involve changing at some stations. Budapest, however, is an interesting place to change trains. You can book this tour alone as well. You can fly to Bratislava and take a train from there. There is a suitable train connection from Bratislava to Brezno, departing every second hour from Bratislava and takes almost five hours. We’ll arrange a pick up from the railway station. By chartered minibus transfer to the railway in Čierny Balog. Around 08.00 hrs the lager Budapest-built loco (4280/1916) takes a snow plough to Hronec. The small Budapest (1879/1906) will follow the snow plough service train with a rake of empties. 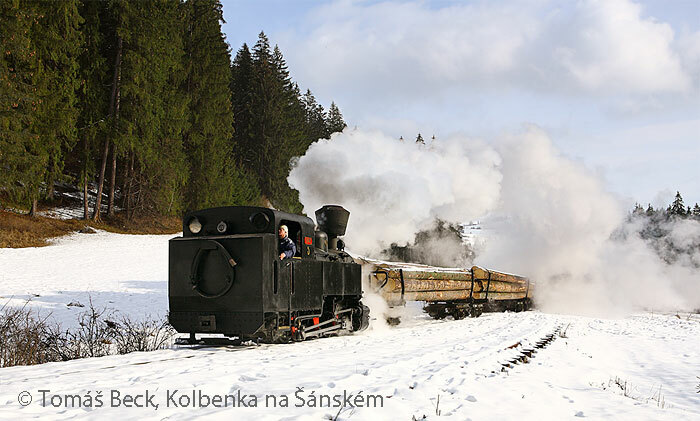 The snow plough will be dropped in Hronec, both locos will take over the empty train and haul it uphill to Čierny Balog. We’re travelling in the track gang wagons. In the afternoon we’ll haul empties to Vydrovo and return in the twilight with a loaded train to Čierny Balog. In the early evening we’ll take some night shots in the depot (both locos getting serviced). By mini bus back to our accommodation. 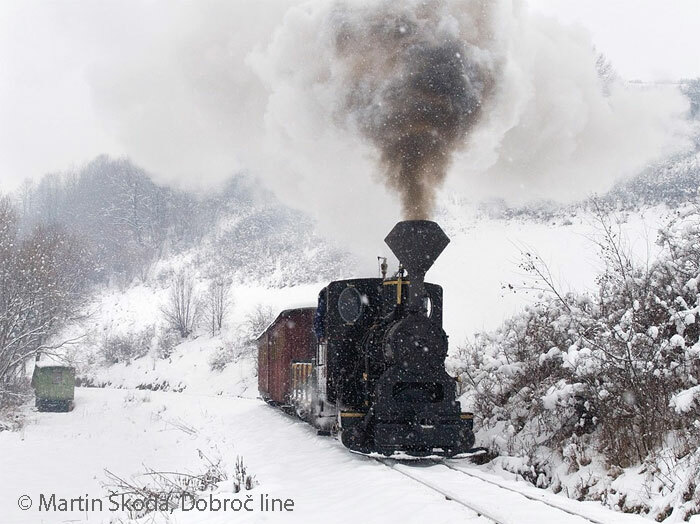 Around 7 am the minibuses take us back to the railway station where we’ll steam with the U34, two service wagons and one or two freight wagons up to the loading point Dobroč. Around 9.45 hrs we’ll roll down with a loaded train from there to Čierny Balog (bunker first). Arrival Dresden 06.49 and Berlin Central 09.08 hrs in the morning. More than 100 years ago many forests were explored by forestry lines, especially in central and Eastern Europe. Čierny Hron, today mostly know as Čierny Balog was among them, and in 1908 they built the first stretch of the line. Over the years the system was developed to a total length of 132 km. The museum line has five serviceable pairs of trucks for logging transport plus a few flat wagons which were also used for wood transport, mainly sawn logs or planks. 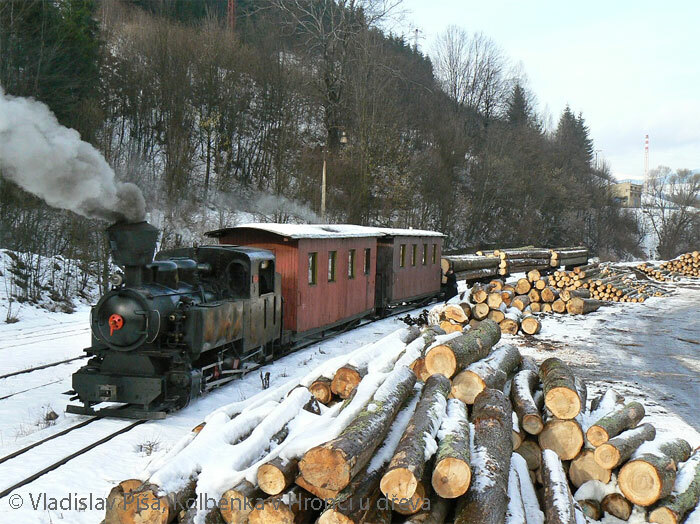 As usual on most of the logging lines in the mountains empty trains were brought chimney first uphill into the forests to the loading points while loaded logging trains rolled downhill tender first to the sawmills in the valley. This was the usual operation in Čierny Balog as well. However, there were sawmills in Čierny Balog and Hronec. Because the mill in Čierny Balog was larger it could process the biggest logs. This caused sometimes the unusual transport of logs from the lower end of the line up to Čierny Balog. In later years when the saw mill in Hronec was working beyond capacity or in need of repair there were often trains loaded with logs which went the “wrong way round” i.e. “into the forest” to go to the capable sawmill in Čierny Balog. Even in the last year of real operation, in 1982, there could be seen loaded logging trains going uphill to Čierny Balog. Hence loaded trains chimney first uphill are authentic on this line  which gives us some additional photo options. PLD 2 (Budapest 4280/1916) - originally for "Povážská lesná železnica" forestry railway, typical big 760 mm loco for Hungarian forest railways. From the list you can see that we can only use the Budapest 1879/1906 and 4280/1916 to form reasonably authentic trains. 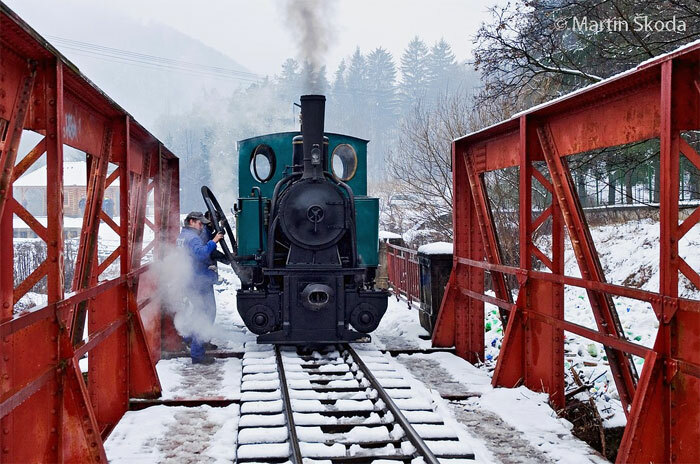 The trains will look authentic, but the locos are not original Čierny Balog engines. This is the compromise we need to allow. However, the trains will look good and we will load one of the trains with real logs to make it look even more authentic. We’re travelling in winter time when temperatures can drop below -20° Centigrade. Although this will give us the opportunity for some outstanding pictures, it’s not to everyone’s taste. If you are used to the north Chinese winter you have nothing to fear, but if you like the mild climate of the UK you may feel threatened by the weather. There can be a lot of snow (which would be nice photographically) but there can also be a lousy winter with no snow and drizzling rain at +2° Centigrade. So it’s as always: sit by your stove at home for the safe method of getting bored, or take the risk of either a foggy, rainy, muddy nothing or a brilliant blue sky with snow and -7° Centigrade which allows us to see steam clouds from our locos as huge as skyscrapers. It’s always a risk to leave home, and this tour is no exception. There are no guarantees. The loco can fail, snow can block the line, a flood can wash away parts of the track and so on. The chance of receiving any compensation if things do not go to plan are microscopic. Taking part in the event means you must accept that nothing is guaranteed and refunds are highly unlikely if something does not run to our liking. We’ve included half board with the option, in case of poor weather, to take a break for lunch. The bus we’re using is a minibus which must make two journeys to transfer the group. Slovakia is a member of the European Union and a Schengen state. They use the Euro as their currency. A traveller from the EU does not need a visa, just a valid ID. Others please check with your embassy. Slovakia can require that you have sufficient money when entering. They rate 64 Euros per day as sufficient. Slovakia is a secure country. However, there is always a risk in and around railways, especially if you want to jump on or off a moving train (which is prohibited) or mix with moving rail vehicles as well as road traffic. Using common sense is the best way to avoid incidents. FarRail Tours or the local operator cannot be held responsible in any cases of accidents, damages, delays etc. You’re travelling at your own risk. The number of available single rooms in Cierny Balog is very limited.